2019 marks the 200th anniversary of the birth of Queen Victoria, so what better time to take your students on a trip back in time to the Victorian period? A trip to the Beamish, The Living Museum of the North will allow students from Key Stage 1-3 to take part in a Victorian Lesson. Here are some of the venues and attractions that you can visit to bring the Victorian age to life for your pupils. It was at Osborne House on the Isle of Wight that Victoria and Albert raised their children, and where Victoria retreated after the death of her husband. A trip to the house will provide an insight into the private life of the monarch, while curriculum links for Key Stages 1-3 can help schools explore significant historical events, develop an understanding of British History and learn about the British Empire. However, when it comes to learning about Queen Victoria, you must pay a visit to Kensington Palace; she was born within the Palace, and spent a majority of her childhood there with her mother, the Duchess of Kent. School groups can choose to participate in a range of education sessions, including the Growing Up at Kensington: Queen Victoria workshop, which will give students a greater understanding of the monarch’s childhood, and the Victorian era as a whole. Next year, on 24th May, the Palace will also open a walk-through exhibition, which will see rooms reimagined as they would have been when Victoria was growing up there. The Victoria and Albert Museum (V&A) in London, offers a solid introduction for learning about the Victorians and their Queen. From the dress collection, representing fashion during the 19th century, to the many paintings on display, the collections offer an insight into Victorian life. Interactive sessions can go a long way in helping to bring a subject to life, and there are a number of venues across the country that offer students the opportunity to step into the roles of Victorian citizens. For those exploring the differences between schools now and schools in the Victorian Period, a visit to Beamish, The Living Museum of the North in County Durham allows school groups to take part in a Victorian lesson, suitable for Key Stages 1-3. 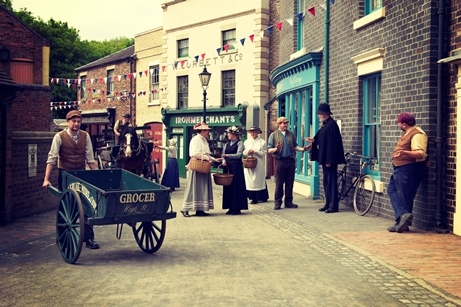 Meanwhile, a school trip to the Blists Hill Victorian Town, located within the Ironbridge Gorge Museums in Telford, will see students transported back in time. Enjoy demonstrations, wander through authentic shops and cottages, and take part in educational workshops within the recreated Victorian Town. A visit to the Victorian Kitchen in Beaulieu, within Palace House, will have pupils taking on the role of Victorian school children as they try to seek employment as kitchen maids, housemaids, footmen or chauffeurs. Similarly, schools visiting the historic estate of Tatton Park in Cheshire will see their students transformed into servants, as they learn what life was like for people living in Victorian England and see first-hand the contrasts between the rich and the poor as they tour the living quarters in the house. The HMS Warrior 1860 was Britain’s first iron-hulled, armoured battleship and it was the pride of Queen Victoria’s fleet. Teachers looking for a unique venue to explore Victorian society with their students can participate in immersive workshops, discovery visits and learning activities on board the Victorian warship. Cadbury World might seem like an unconventional destination for a school trip intended to educate students on the Victorian era, but the creative talks provide an interesting insight. Interactive discussions will teach pupils about children during Victorian England, whilst discussing why Richard and George Cadbury were model Victorian workers – alongside a tour of Cadbury World, of course.